DETROIT -- Takata Corp. on Monday removed a major obstacle to its potential sale or restructuring, pleading guilty in a U.S. federal court to a felony charge as part of a $1 billion settlement that included compensation funds for automakers and victims of its faulty airbag inflators. Steeh said automakers could be victims of Takata's decisions to hide evidence over 15 years that its inflators were defective and still be subject to civil litigation for harm done to individuals. With the criminal settlement and penalties set, Takata is expected to intensify its search for a buyer or financial backer. Steeh said he considered imposing a stiffer sentence, noting federal guidelines allowed for up to $1.5 billion in fines. 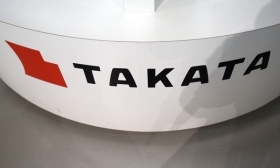 But the judge said he approved the settlement because Takata could otherwise be pushed into bankruptcy, delaying efforts to replace millions of potentially deadly inflators still on the road. "Destruction of the corporation would probably have been a fair outcome in this case," Steeh said, adding he had been involved in a separate case in which Takata had admitted to price fixing. Lawyers for U.S. vehicle owners have sued Honda Motor Co., Nissan Motor Co., BMW AG, Ford Motor Co., Mazda Motor Corp. and other automakers, alleging they knew about the defective Takata inflators for years but kept using them. Lawyers for vehicle owners said in a court filing on Monday in Florida that automakers acted "recklessly" because "they were focused on the low price of Takata’s inflators and concerned that if they stopped using Takata’s inflators, they might not have a sufficient supply." At least 16 deaths have been linked to exploding Takata inflators. The defects have led 10 automakers to recall more than 31 million cars worldwide since 2008. All but one of the deaths have occurred in Honda vehicles. The automakers could face costs to replace all the defective airbags "that would be 5, 6 or 9 times the $850 million" set aside in the fund, Steeh said, indicating the total replacement cost could be more than $7.6 billion. The Takata airbag recall is the largest ever for the auto industry. Yoichiro Nomura, Takata's chief financial officer, appeared in court to formally accept the plea agreement. "I would like to sincerely apologize on behalf of Takata," he said. In January, Takata agreed to establish two independently administered restitution funds: one for $850 million to compensate automakers for recalls, and a $125 million fund for individuals physically injured by Takata’s airbags who have not already reached a settlement with the company. Automakers in the United States are set to continue recalling defective inflators through 2020. U.S. safety regulators have said automakers are responsible for replacing defective airbags no matter what happens to Takata. The investigation of Takata was the latest criminal probe by U.S. prosecutors of automakers or suppliers accused of trying to duck costly steps required to comply with safety or environmental regulations. Toyota and GM paid hefty fines to settle charges they unlawfully hid safety defects from regulators, and Volkswagen AG in January paid $4.3 billion to settle criminal charges related to its cheating on diesel emissions tests. Takata is seeking financial backers as it faces potentially billions of dollars in recall-associated costs. It has not identified what company has been selected by a steering committee leading that process. Key Safety Systems, a Chinese-owned auto supplier, is the leading candidate, people familiar with the process said in early February. A person briefed on the matter told Reuters on Monday a decision may be reached by the end of March. Takata has denied investor speculation that it would have to seek some form of bankruptcy protection in the United States or Japan. However, during the court hearing, Judge Steeh and lawyers for the Justice Department alluded to the potential for Takata to collapse if it could not find a buyer. As part of the agreement with U.S. authorities, Takata has agreed to pay a $25 million fine and has 30 days to pay the $125 million for victim compensation. Takata has up to a year to deliver the remaining $850 million for automaker compensation. If a financial backer takes control of Takata, however, the money for the automakers must be delivered within five days. Reuters had reported in November that Takata may file for bankruptcy as part of a restructuring. Steeh said he will decide who should manage the compensation funds after considering proposals from potential candidates. Takata will be on probation and under the oversight of an independent monitor for three years, and has agreed to make significant reforms in the way it handles safety issues. The Justice Department has demanded similar oversight to resolve the investigations into mishandling of auto safety problems at GM and Toyota. The settlement of the federal criminal case does not end Takata's legal troubles. The company faces multiple civil suits brought on behalf of people injured by exploding inflators. Kevin Dean, a South Carolina lawyer for some Takata victims suing automakers, said in a court filing on Monday in Detroit that the criminal plea agreement is "wrought with inaccurate, incomplete and misleading assertions of fact" that could help automakers avoid liability. In court, Dean told Judge Steeh that automakers will argue in the civil cases that they are not responsible for airbag-related injuries or deaths because Takata has now admitted hiding evidence that the inflators could rupture. U.S. prosecutors also have charged three former senior Takata executives in Japan with falsifying test results to conceal the defect.